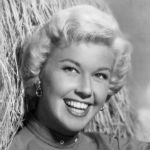 Doris Day (April 3, 1922 or 1924) is a retired American actress and singer. Day began her career as a big band singer in 1939. Her popularity began to rise after her first hit recording “Sentimental Journey“, in 1945. After leaving Les Brown & His Band of Renown to embark on a solo career, Day started her long-lasting partnership with Columbia Records, which remained her only recording label. The contract lasted from 1947 to 1967 and included more than 650 recordings, making Day one of the most popular and acclaimed singers of the 20th century. She received the Grammy Lifetime Achievement Award and a Legend Award from the Society of Singers. In 2011, she released her 29th studio album, My Heart, which debuted at No. 9 on the UK Top 40 charts. As of January 2014, Day is the oldest living artist to score a UK Top 10 with an album featuring new material. She became well known for her string of musicals with Gordon MacRae in the early 1950s, and later, romantic comedies with handsome leading men such as Clark Gable, Rock Hudson, Cary Grant and James Garner. She became the top-ranking female box-office star of all time and is currently ranked sixth among the top 10 box office performers as of 2012.